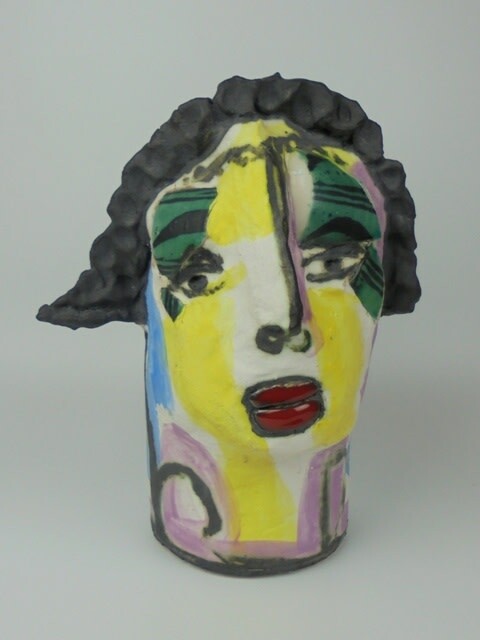 Mary Jones "My main interest as a ceramic artist is the human emotions and how they are translated in our faces. I have conversations with people, usually about their memories. Often people like to share stories from their childhood revealing a wide variety of emotions. My chief intention is to find different ways to convey these emotions, communicating them through my ceramic practice, consequently giving each piece a 'Presence'. As I explore and develop exciting relationships between colour, texture, drawing and form, I endeavour to capture the essence of who we are, revealing our internal worlds. While striving to capture other people's emotions in my work, I discover the creating process becomes an integral part of who I am. Consequently and unintentionally the work therefore absorbs some of my own memories and emotions. My work is sculptural, figurative, painterly and expressive."